Two Delicious Whole Baked Fish. 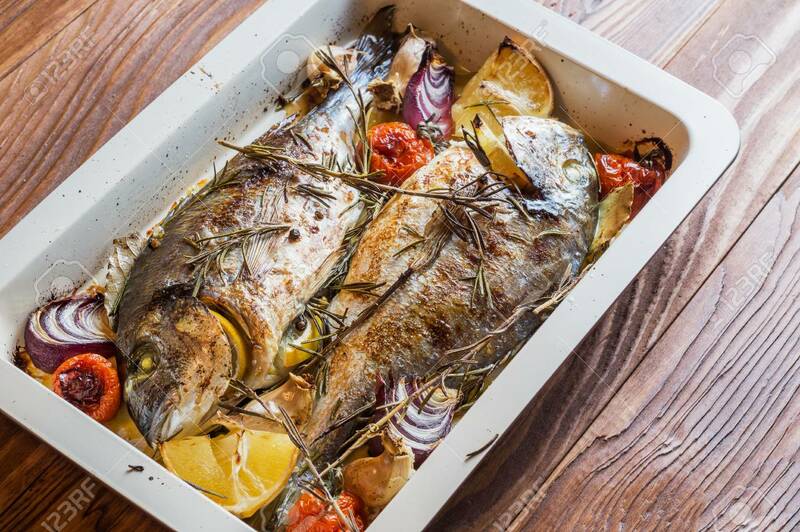 Baked Dorado With Lemon, Onions, Rosemary, Cherry Tomatoes, And Spices On A Wooden Background. Delicious Roasted Dorado On Oven Tray. Diet And Healthy Food. Top View. Lizenzfreie Fotos, Bilder Und Stock Fotografie. Image 91427218. Standard-Bild - Two delicious whole baked fish. Baked dorado with lemon, onions, rosemary, cherry tomatoes, and spices on a wooden background. Delicious roasted dorado on oven tray. Diet and healthy food. Top view. Two delicious whole baked fish. Baked dorado with lemon, onions, rosemary, cherry tomatoes, and spices on a wooden background. Delicious roasted dorado on oven tray. Diet and healthy food. Top view.